This was my first caving trip of the year (too many quarry trips capturing graffiti makes you soft) and tuesday afternoon it looked as if it was all going pear shaped. Snow had fallen on south wales and everyone was suspicious of the steep small lanes up to from llangattock. Even the sensible suggestion that we drive along the top road from Brynmawr to get to whitewalls was viewed as a recipe of ending up in a ditch. 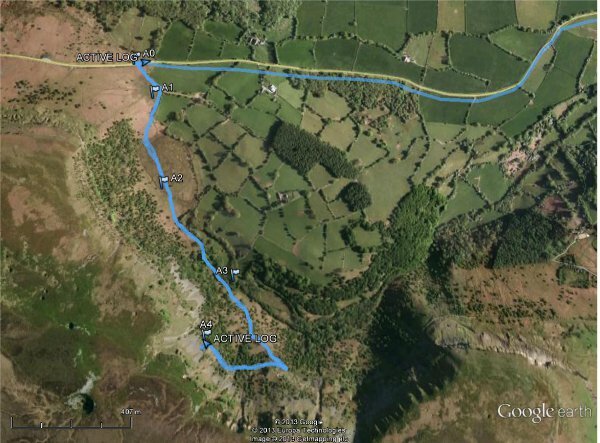 So I suggested that we used a route that some members of Brynmawr caving club used years ago and walk to Agen Allwedd directly from the Beaufort road - here on streetmap This managed to persuade Jennie and Tim but the others jumped ship and drank hot chocolate back in bristol. So instead of risking our cars we decided on a night walk up a mountain. Actually Tim agreed because he fancied the walk - he had just spent the weekend walking in the breacons just to the north. I hurriedly marked the waypoints on my first generation gps (no lush screen and maps) by taking the coordinates from streetmap. Tim eschewed all such navigational aids other than the streetmap map from the road. 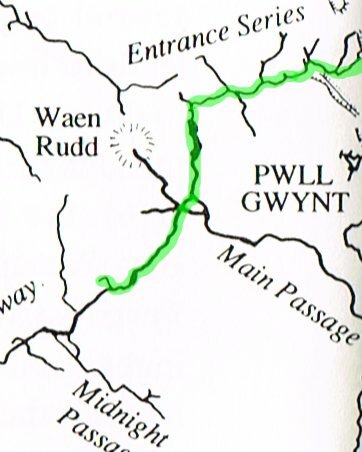 The route goes from the cattle grid just outside llangattock on the beaufort road. As we approached the cattle grid the snow appeared (it was much lower than at the weekend) about the 250m contour and we were going to walk up to the cave on the 350m contour. wobble along the 300m contour (I had not marked the cave entrance) but Jennie insisted that we continue up and eventually we reached the old tramway and then backtracked to the cave entrance. The walk up was easy but we now knew the path down was steep and about a foot wide in places. We had brought walkers sticks and on the way down I was deeming them essential (but jennie did without). The descent back down the mountain was definitely the biggest adventure of our trip. Our plan was to head some way down the main streamway in the direction of the second boulder choke. Our summit was at a little interesting side passage in an ox-bow off the streamway. There was a tempting looking climb that we could not see the end to but we timed out and must save this for a later visit. Great little trip - we were at the cave entrance for 21:50 and the walk up in the snow took 30 minutes. Our little trip paled into insignifance next in the log book to a wessex cc trip from 00:15 to 21:50 on the monday! What were they doing at priory road for so long?